Examples of frostbite are shown below. Go to Frostbite for complete information on this topic. Address life-threatening conditions, such as injury from major trauma and hypothermia, first. If able, move the patient to a warm, dry area and remove all wet clothing and jewelry and replace with dry, soft clothing and/or blankets/sleeping bags to minimize further heat loss. Avoid further trauma that might exacerbate the injury, such as rubbing the area. After rewarming, aloe vera ointment, if available, should be applied liberally before clean, nonadherent dressings (eg, paraffin gauze) are applied. Blisters should not be debrided in the field. The affected body part is likely to be an extremity, so wrap it in a bulky dressing or blanket for mechanical protection during transport. In addition, oral hydration and administration of ibuprofen may improve the outcome, if feasible. Avoid alcohol or sedatives, which can enhance heat loss and impair shivering. Address life-threatening conditions first. Fluid resuscitation, especially in persons with frostbite occurring at altitude, enhances blood flow and tissue perfusion. Rapidly rewarm the affected body part, avoiding further trauma. An appropriate warming technique is the use of a whirlpool bath or tub of water at 37-39°C (98.6-102.2°F). Mild antibacterial soap may be added. Avoid warmer temperatures or dry heat because of the risk of thermal injury. [10, 11] If a tub is not available, use warm, wet packs at the same temperature. Avoid massaging the affected area, as this can cause further injury. Thawing usually takes 20-40 minutes and is complete when the distal tip of the affected area flushes and tissue is soft and pliable and has taken on a reddish-purple color. Once thawed, keep the body part on sterile sheets, elevated, and splinted when possible. A cradle may be used over an injured lower extremity to avoid pressure or trauma. Administer analgesics, such as morphine sulfate, as needed for pain. Ibuprofen should also be administered. The approach to blisters is debated. It is reasonable to debride clear blisters to prevent thromboxane-mediated tissue injury and to leave hemorrhagic blisters intact to reduce the risk of infection. Apply topical aloe vera gel every 6 hours with dressing changes and use non adherent dressings until expert wound advice is obtained. There is no role for antibiotic therapy in acute frostbite. In the rare situation of an open fracture associated with an area of frostbite, then appropriate antibiotic therapy is warranted. Tetanus prophylaxis should be administered if the patient's vaccination status is not current or unknown. In patients with an associated dislocation, perform reduction as soon as thawing is complete. Manage fractures conservatively until post-thaw edema has resolved. Heparin or low-molecular-weight heparin can be used as an adjunctive therapy with tPA, but it is not recommended as a monotherapy. It is indicated to reduce thromboembolic disease due to the immobility resulting from treatment. Lower extremity involvement, infection, and delay in seeking medical attention are associated with an increased risk of operative therapy. Surgical consultation is appropriate for guiding long-term management, including debridement for infections not responding to conservative management or for skin grafting. As frostbite often occurs in extremities, a surgical consult for involved fingers should occur early as functional considerations are important. Transfer the patient to another facility if treating personnel are unfamiliar with the management of frostbite and its sequelae and/or if the area involved is functionally important (eg, nose, fingers). In some settings, burn units have particular expertise in managing severe frostbite injuries. In one report, 29% of homeless patients admitted to a burn unit were admitted for frostbite. Therefore, transfer to a facility with a burn unit should be considered. Cappaert TA, Stone JA, Castellani JW, Krause BA, Smith D, Stephens BA. National Athletic Trainers' Association position statement: environmental cold injuries. J Athl Train. 2008 Oct-Dec. 43(6):640-58. [Medline]. Ikäheimo TM, Hassi J. Frostbites in circumpolar areas. Glob Health Action. 2011. 4:[Medline]. [Full Text]. 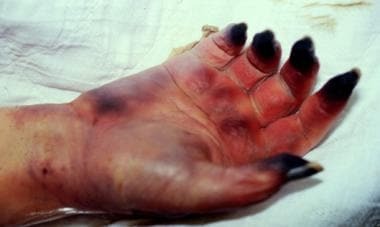 Arbab M, Mirfazaelian H. Frostbite caused by liquid CO(2) exposure. Emerg Med Australas. 2014 Apr. 26 (2):208-9. [Medline]. Moore GW, Semple JL. Freezing and frostbite on mount everest: new insights into wind chill and freezing times at extreme altitude. High Alt Med Biol. 2011 Fall. 12(3):271-5. [Medline]. Makinen TM, Jokelainen J, Nayha S, Laatikainen T, Jousilahti P, Hassi J. Occurrence of frostbite in the general population--work-related and individual factors. Scand J Work Environ Health. 2009 Sep. 35(5):384-93. [Medline]. Cauchy E, Davis CB, Pasquier M, Meyer EF, Hackett PH. A New Proposal for Management of Severe Frostbite in the Austere Environment. Wilderness Environ Med. 2016 Mar. 27 (1):92-9. [Medline]. [Guideline] Zafren K, Giesbrecht G. State of Alaska Cold Injury Guidlines. State of Alaska Department of Health and Social Services. Available at http://dhss.alaska.gov/dph/Emergency/Documents/ems/documents/Alaska%20DHSS%20EMS%20Cold%20Injuries%20Guidelines%20June%202014.pdf. 2014; Accessed: April 21, 2017. Handford C, Buxton P, Russell K, Imray CE, McIntosh SE, Freer L, et al. Frostbite: a practical approach to hospital management. Extrem Physiol Med. 2014 Apr 22. 3:7. [Medline]. Petrone P, Asensio JA, Marini CP. Management of accidental hypothermia and cold injury. Curr Probl Surg. 2014 Oct. 51 (10):417-31. [Medline].